Thank you all for your well wishes yesterday, I feel much better after a day of rest. Recently on a walk through the borough of Southwark I came across America Street. I felt certain there would be an interesting history associated with it. I can't find anything. The best I can offer is the the nearby Cathedral has close ties with America. John Havard a parishioner lost most of his family members during the Southwark plague, he and his wife then left for Massachusetts in 1637. Unfortunately John died a year later of consumption. There are also connections with the cathedral of settlers who went to Connecticut and in typical colonist fashion appropriated land from the indigenous tribes. A petition was presented to Queen Anne who ruled in favour of the indigenous people. this ruling was ignored. In 1735 a group comprising both indigenous and settlers came to London to petition King George II to restore their lands. Disaster struck and the entire party died of smallpox before meeting the King. The lands remained with the settlers. That's like a dark goli.I like it. I saw a lot of streets like this when I stayed in this area a few years ago. 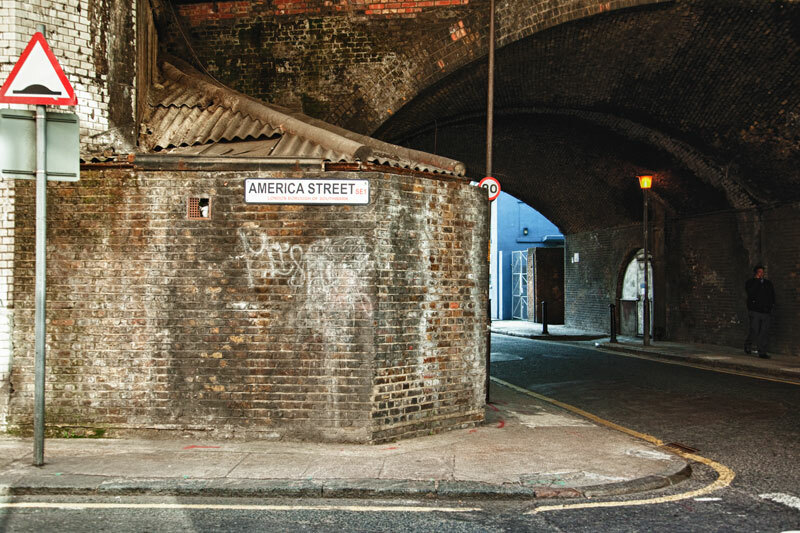 But, I never did see America street. I would have liked to see this. Extra information: the tribes the colonists stole land from still own land here. We actually have two reservations here in Conncticut, and I live about 20 minutes away from both reservations. And (surprise surprise) we have two Casinos on the res... Mohegan Sun and Foxwoods. I missed yesterday so I am a day late in wishing you a quick recovery (which it seems you are having!). John Harvard wasn't personally important in America, but he did leave his name with a very important university. And, you are right, the European settlers didn't play fair in seizing the natives' property. Rubbish street mind. The council records office may have info on naming streets. Those colonials have a lot to answer for, in so many parts of the world! Glad you're feeling better Mo, it's so horrible feeling ughy!! btw because we're such a water orientated country, all school children learn to swim and any who are interested get taught scuba diving, canoeing, surfing etc.